There are several types of mites that can invade and live in the ear canals of dogs and cats, but they are always known simply as eat mites and cause the same symptoms of scratching, shaking of the head, and discomfort. In extreme cases, a pet may end up with cuts and scabs from scratching too much and the ear drum and canal can be damaged from the infestation. How are ear mites transmitted? Mites are transmitted from pet to pet. The mites will reproduce and grow in number and seek out new places to live. Dogs, cats, rabbits, hamsters, and other small pets can get ear mites. The mites do not affect us. Your cat or dog will scratch and shake their heads a lot trying to rid themselves of the tickling feeling of the mites and the debris that is building up inside their ears. The amount of scratching depends on the severity of the mites. Some pets may end up with hair loss behind their ears from scratching too much and some cuts. The ears may also have blood on the inside and it will start to resemble black coffee grounds. 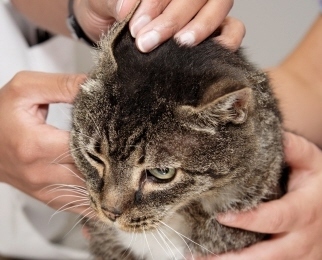 A vet will be able to diagnose if it is ear mites or an infection. First, before you start treating the mites, you should have your vet examine your pet to make sure the discomfort your pet is experiencing is due to mites and not a bacterial infection. Your vet will then recommend a treatment of ear drops or topical treatment like using Frontline or Revolution. Most ear mite medication contains either pyrethrin or ivermectin, which are insecticides. Depending upon the medication used, the ears may need several rounds of treatment. If you have a multi-pet household you’ll need to treat all the pets even if the others aren’t showing symptoms. Mites don’t often survive long on their own, so treating the house or a yard is often unnecessary. You can also ask if an herbal remedy will be strong enough and effective in ridding ear mites when you talk to your vet. Once your pet is mite free, keep the ears clean and keep your pet healthy. People can not get ear mites from their dogs and cats. I’d suggest taking your cat to the vet to get the right treatment and make sure he’s healthy.